One of Liberia's most high-profile doctors has died of Ebola, officials said Sunday, and an American physician was being treated for the deadly virus, highlighting the risks facing health workers trying to combat an outbreak that has killed more than 670 people in West Africa — the largest ever recorded. Dr. Samuel Brisbane was treating Ebola patients at the country's largest hospital, the John F. Kennedy Memorial Medical Center in Monrovia, when he fell ill. He died Saturday, said Tolbert Nyenswah, an assistant health minister. A Ugandan doctor died earlier this month. The American, 33-year-old Dr. Kent Brantly, was in Liberia helping to respond to the outbreak that has killed 129 people nationwide when he fell ill, according to the North Carolina-based medical charity, Samaritan's Purse. "We are hopeful, but he is certainly not out of the woods yet," she said. Early treatment improves a patient's chances of survival, and Strickland said Brantly recognized his own symptoms and began receiving care immediately. There is no known cure for the highly contagious virus, which is one of the world's deadliest. 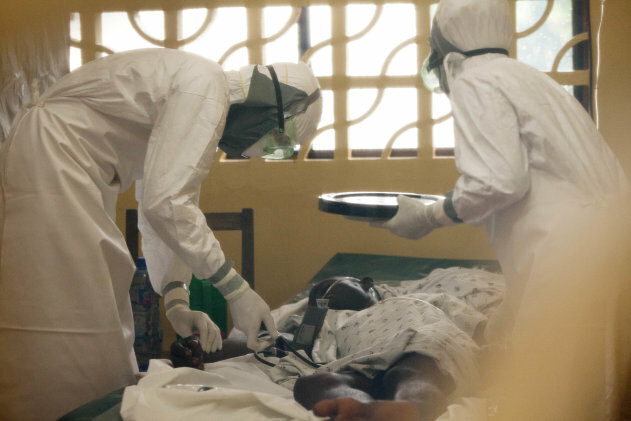 At least 1,201 people have been infected in Liberia, Sierra Leone and Guinea, according to the World Health Organization, and 672 have died. Besides the Liberian fatalities, 319 people have died in Guinea and 224 in Sierra Leone.